The cult classic TV show Twin Peaks (1990) is set to return to television early next year after a quarter-century hiatus. If you’re one of the many fans out there gearing up for the new season by re-watching old episodes, now you can spice up your viewing experience by playing a game of Twin Peaks bingo while you watch. Created by Videology Bar and Cinema in Brooklyn, New York, these bingo cards are exactly what they seem: Each card comes with 24 different images (plus a free space marked with Dale Cooper’s face) of characters, sayings, locations, and recurring motifs in the show. Players simply mark their cards with a bingo chip every time a space matches something occurring on screen. For example, card images include characters like the lovable Sheriff Truman or despicable Leo Johnson, sayings like “damn fine coffee,” and visual motifs like the wind blowing through trees. Videology, a former video store converted into a bar, has been hosting live Twin Peaks bingo events for several years. 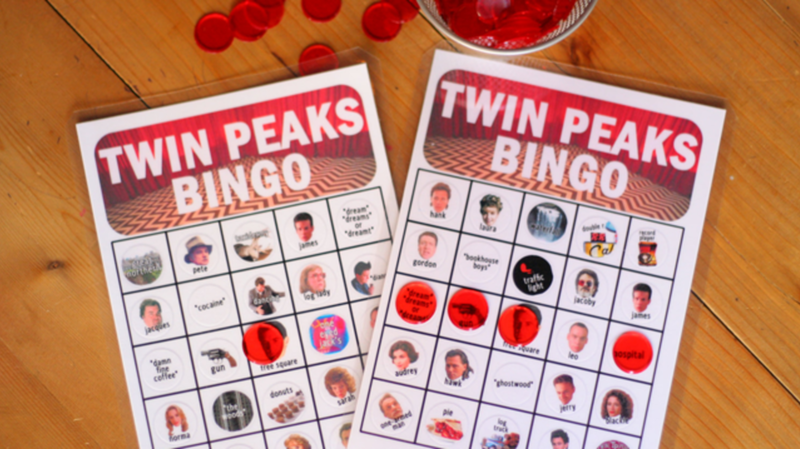 The handmade bingo cards available to purchase on Etsy are the same as the ones used in the live event, created by Twin Peaks fanatics for Twin Peaks fanatics. As Dale Cooper once said, “Every day, once a day, give yourself a present. Don’t plan it; don’t wait for it; just let it happen. It could be a new shirt in a men’s store, a catnap in your office chair, or two cups of good, hot, black, coffee.” Or a brand new set of Twin Peaks bingo cards for a damn fine binge-watching party.